ASUS X53U-SX155V laptop review - this affordable 15.6-inch Asus laptop comes just on time for the beginning of the school year. Asus X53U is perfect for home users as it has the basic stuff that you may need. Asus X53U laptop has a nice 15.6-inch HD LED display with native resolution of 1366x769 pixels. The display is bright with good contrast and vivid colors. The processing performance of this laptop comes form the 1.6GHz dual-core processor which is part of the AMD E-Series. It is not the fastest and coolest processors out there but it will do the job just fine. 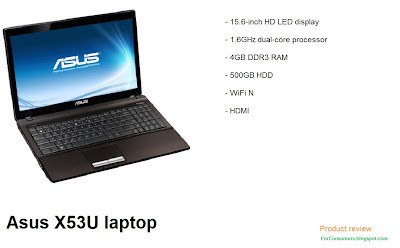 Asus X53U laptop usually comes with 4GB of DDR3 RAM and a 500GB hard drive capacity. The video performance of the Asus X53U is provided by the AMD Radeon HD6310M integrated graphics accelerator. Connectivity options include fast WiFi N connection and most of the interfaces/ports that are standard for laptops of this size like 3x USB ports, HDMI port and some others. The optical drive of the Asus X53U-SX155V laptop is DVD rewriter. Asus X53U also has very good Altec Lansing speakers that will provide you with amazing sound quality. Another useful multimedia feature is the integrated webcam and microphone which do great job for Skype calls and many other applications. The battery inserted in the Asus X53U laptop will hold charge for around 2-3 hours of work before it needs recharging. As for the price we mentioned this laptop is quite cheap. You can find it in online tech stores for as low as £250 (in UK). Considering the useful features and specifications of the Asus X53U-SX155V laptop this seems like quite a good deal. You can also check the full Asus X54C laptop review.